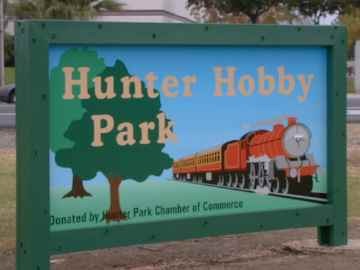 The Riverside Live Steamers is a club located in at Hunter Hobby Park in Riverside CA. They operate a large layout in a public park. 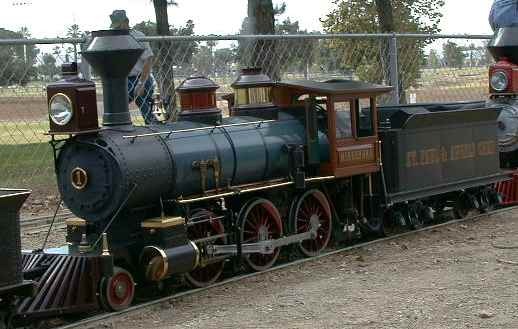 The land for the park was donated to the City of Riverside for use as a public park as long as those that wanted to could run live steam trains there. The city maintains the park and the club maintains the railroad property. The park also contains a baseball field, a field suitable for soccer or football and considerable area of rolling lawns. The sign was just being dedicated as I got there. Some of the club members were unhappy about the British prototype depicted on the sign. The club operates for the public on the 2nd and 4th Sundays of every month from 10 AM to 3 PM. All train rides are free, but donations are accepted. The terms of the agreement deeding the property to the city specifically stated "live steam" and this has been taken literally. Diesels are absolutely not allowed on the property. The closest that diesels get is the BNSF and UP main lines that run a half block west of the park. A fast train went by every 10 or 15 minutes. There are two main lines, one in 1.5" scale (7.5" gauge) and a shorter one in 1" scale (4.75" gauge). The 1.5" scale line is about 1.5 miles long arranged in a sort of figure 8 arrangement running around and through the park. There is an engine service yard with many service track, two turntables and two transfer tables. There are also several substantial equipment storage buildings and a sort of a club house arrangement. The pictures below are links to more and larger pictures and text along the same themes as the picture shown. There were several Shays and other geared locomotives running at the Fall Meet. This Class B 3 cylinder Shay was running the whole time I was there. It ran very smoothly, although its top speed seemed to be somewhat higher than the prototype. When I got there, Bill was running 2nd in this triple header. 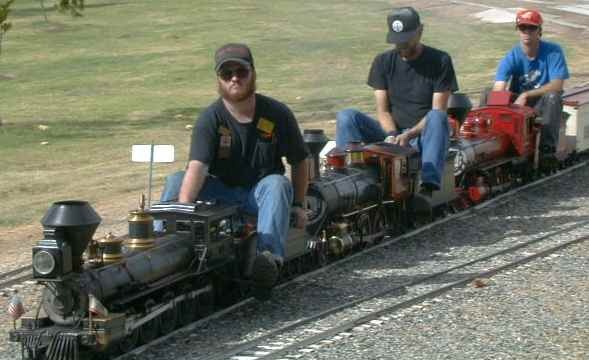 These guys were doing it just for fun as any one of the engines could have handled the 6 car or so train. 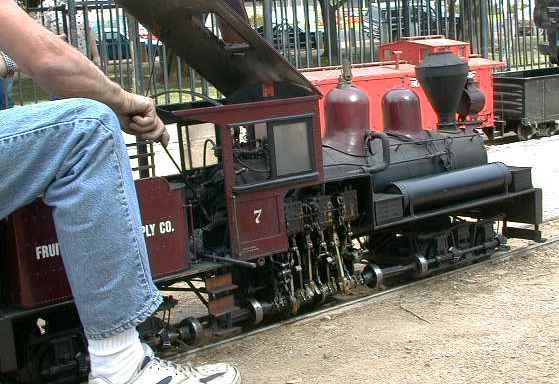 This section links to a series of pictures of engines that I found running on the layout. Every one of them is a work of art.